With Labor Day weekend upon us, we’ve reached the unofficial end of summer. School starts next week and the pool closes, two signs that summer is over, but we’re stretching it out a bit with this gelato based on one of my favorite candies from childhood, Whoppers. The inspiration for this gelato came from two sources: The Perfect Scoop by David Lebovitz, and Making Artisan Gelato by Torrance Kopfer (both books in my personal collection). Lebovitz has a recipe for malted milk ice cream in his book, but I wanted to make it into a gelato, so I followed Kopfer’s methods to make the gelato base and used Lebovitz’s instructions for mixing the malted milk powder. If you enjoy gelato and want to learn how to make it at home, I highly recommend Kopfer’s book because it has so much helpful information on how to get that creamy gelato texture or at least approximate it with common home ice cream makers. My boys saw the box of Whoppers on the counter, a sweet they had not tried before, and curiously asked for one. That one taste was all it took and they got very excited about the “Whopper ice cream.” I’ll be the first to admit that these little chocolate coated balls aren’t healthy and would probably rot your teeth and make you gain five pounds if you ate the whole carton, but we’re talking moderation here. If you share the gelato and the Whoppers, you’ll be fine. Makes about 1 quart/1 liter. 1. In one of the 3-quart bowls, stir together the heavy cream, vanilla extract, and malted milk powder. Set aside. 2. Put the split vanilla bean and its seeds in the bottom of the saucepan, then add the milk and 1/2 cup (100 g) of the sugar. Cook over medium heat, stirring occasionally, until the thermometer registers 170° F/77° C. Remove from heat, cover, and allow to steep for 30 minutes. 3. Remove the vanilla bean pod and return the pot to the burner. Warm over medium heat, stirring occasionally to prevent scorching, until the thermometer registers 170° F/77° C.
4. In the other 3-quart bowl, whisk the egg yolks with the remaining 1/4 cup (50 g) sugar until the mixture is foamy and slightly thickened. 6. Make an ice bath in the large bowl and set the bowl with the heavy cream mixture on top. Place a fine-mesh strainer on the rim of the bowl and carefully pour the custard through the strainer. Stir the custard about every 5 minutes until the mixture is cooled, about 30 minutes. Remove the bowl from the ice bath, dry the bottom, and cover with plastic wrap. Chill in the refrigerator for at least 8 hours or overnight. 7. About 30 minutes before churning, set the bowl in the freezer to get the mixture as cold as possible without starting to freeze. Pour the mixture into your ice cream maker and follow the manufacturer’s directions for processing. Add the chopped malted milk balls during the final 2 minutes of churning. 8. Store the gelato in a plastic container. Press a layer of plastic wrap against the gelato and seal the lid on top. Freeze until fully hardened. I don’t know what possessed me, but I threw a box of whoppers in my shopping cart at the grocery store the other day. I knew I was going to bake something. Wonder if it’s going to be something frozen? This brings back many childhood memories to me as well! How uniwue and lovely! 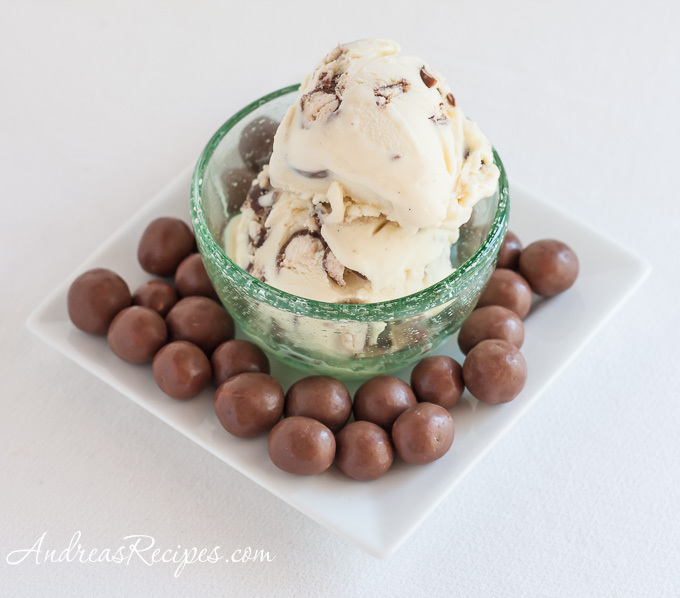 Malted milk gelato sounds so good! Thanks for the link! Love your site. The gelato looks very good. I wish I had some now! When do you add heavy cream, vanilla extract’ and malted milk powder? That part is not clear.